Pros: Excellent performers, ingenious design and impeccable direction. Cons: The period setting is sometimes confused. 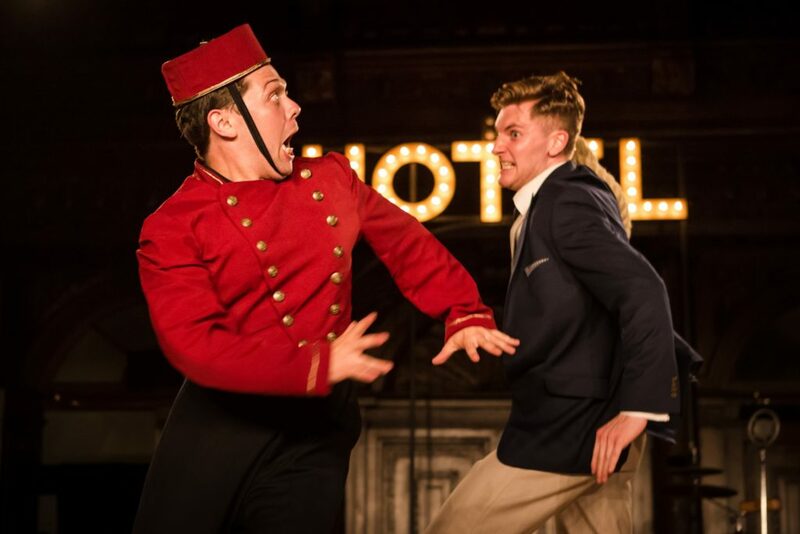 A dazzling and groundbreaking production of an English classic comedy. The Comedy of Errors is one of Shakespeare’s earliest works and certainly his shortest. Significantly influenced by Plautus’ Latin comedy Menaechmi, it is the story of two pairs of twins who fall victim to a series of mishaps related to their ambiguous identity. Egeon (Paul Croft) is a merchant from Syracuse who heads to Ephesus in search of one of his twin sons, lost twenty-five years earlier in a shipwreck. Antic Disposition’s groundbreaking revival transfers the whole action from the city of Ephesus to the glamorous Bay of Ephesus Hotel, owned by the Mafioso Solinus (Philip Mansfield), where Egeon arrives in 1929, as does his remaining son Anthipholus of Syracuse (William de Coverly) with his servant Dromio of Syracuse (Andrew Venning). Due to a ban on Syracusians entering Ephesus, and to avoid being arrested, the two young men decide to disguise themselves as hotel staff, unaware that their twins Anthipholus of Ephesus (Alex Hooper) and Dromio of Ephesus (Keith Higinbotham) also work in the hotel as manager and bell hop. This is the prologue to a high-paced play of misunderstandings. Inspired by the film Some Like It Hot – also set in 1929 – this production is a sparkling extravaganza of prohibition-era costumes and jazzy tunes played live by a brilliant cast that also doubles as the band. 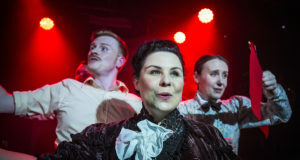 A Marilyn lookalike singer (Susie Broadbent) is Anthipholus of Ephesus’ mistress, whilst his wife Adriana (Ellie Ann Lowe) entertains herself with the wrong twin, who happens to be more inclined towards her sister Luciana (Giovanna Ryan). On the way to discovering their true roots, the unfortunate pairs will have to face the goldsmith Angelo (Paul Sloss) and the mobster Joey Merchant (Scott Brooks), before the abbess Emilia (Louise Templeton) finally unravels the knot of the whole plot. According to the history books, this farcical masterpiece was performed at Gray’s Inn Hall in 1594, when the Bard was still alive. Headquarters of one of London’s four Inns of Court, Gray’s Inn is a gorgeous building which has provided office accommodation to barristers and judges since the 14th century. A small archway on High Holborn leads to South Square, a lovely garden surrounded by the Inn’s buildings. The Hall is a large reception room with a stunning wooden ceiling and a number of Lords’ portraits hanging on the walls. 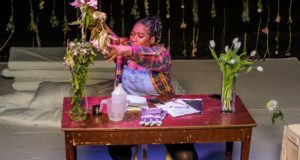 Lighting designer Lizzy Gunby had the arduous task of providing all the necessary brightness to the high ceilings and sombre woodwork but the beautiful stained glasses might have deserved even more attention. Performance designer and co-director John Risebero however, could not have made a better use of the available space, with the audience positioned on three sides and the original inlaid wooden screen as a backdrop. A special mention must also go to the stage manager Damien Stanton, who worked wonders on a group chase across the hall, which seemed to have a perfect timing despite the multiple entrances on stage. 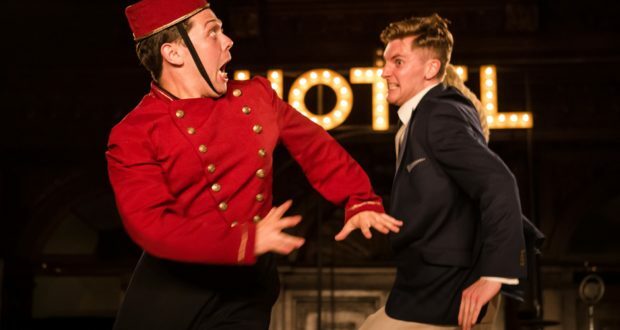 The only blemish on this new take on The Comedy of Errors is the sometimes confusing period setting, which goes from the 1929 outfits to Marilyn Monroe’s late ’50s songs, like I Wanna Be Loved By You. Personally, I found the reference to the film too subtle to be understood without the help of the program. Whilst the Elizabethan language might present a hurdle, it is well worth making the effort for the sake of this pleasurable and exhilarating version of one of English theatre’s timeless staples. This year we celebrate 400 years since Shakespeare’s death and if I were to see only one of his plays, my unhesitating choice would be this outstanding take on The Comedy of Errors, from Antic Disposition.